We slept wonderfully in this big house, the largest we have ever rented. After a homemade breakfast we first explore the area, find out where a store is and where we can have a coffee or something to eat when we feel like it. A collection of houses a little further is the village of Bunessan where with 1 hotel with pub and restaurant, a shop and a café. Everything we need and we immediately do some shopping for the next few days. Then we drive around loch Scridain. The Isle of Mull does not really have a clear form, it is a combination of peninsulas that protrude in all directions, around the many coves. Because of this irregular shape, it has nearly 500 kilometers of coastline. We are on a long spur in the southwest of the island and today we are going to explore the north. The island has an area of 875 square kilometers, but at most 3,000 people live there, so it is very sparsely populated. Because we have never been here before, Teije has a lot of roads to mark on his map and of course he also has to drive the dead-end roads. North of Loch Scridain we find one that leads to the Mull Eagle Watch. This is the area of the sea eagles and you can make walks with a ranger. The sea eagles were reintroduced in the 70s and since 1985 they alos breed on Mull. We take a walk on our own but see no sea eagle and no golden eagle that would also live here. The only eagles we see are on this bench. Well made! Off the coast of Mull are dozens, perhaps hundreds, of islands, inhabited and uninhabited. According to counts, the inner Hebrides consist of 35 inhabited islands and 44 uninhabited ones larger than 30 hectares. But we see dozens of smaller ones off the coast here. The island where we see a large country house is also very small and is probably not counted among the inhabited islands. Probably some rich man that has an entire island for himself ... Do I sound jealous? No, well, maybe a little bit. Near the hamlet of Gruline we see a brown sign pointing to the MacQuarie mausoleum. Very special, however, is that it says: 'The National Trust of Australia (New South Wales)'. Lachlan MacQuarie is buried in the mausoleum with his 2nd wife and their 2 children. He was born on the nearby island of Ulva and fought in the American war of independence (against independence of course), against Napoleon but also against the Dutch VOC. In the end, from 1810 to 1821, he was the last governor of New South Wales and he seems to have done so much for the country that he even nicknamed 'The father of Australia'. We drive along Loch Na Keal to where the ferry sails to Ulva. You can not call it a port, the road just ends in the sea where the ferry is moored. Because we still have enough to see on Mull, we only look at the ferry that sails from one side to the other in a few minutes and decide not to go there today. 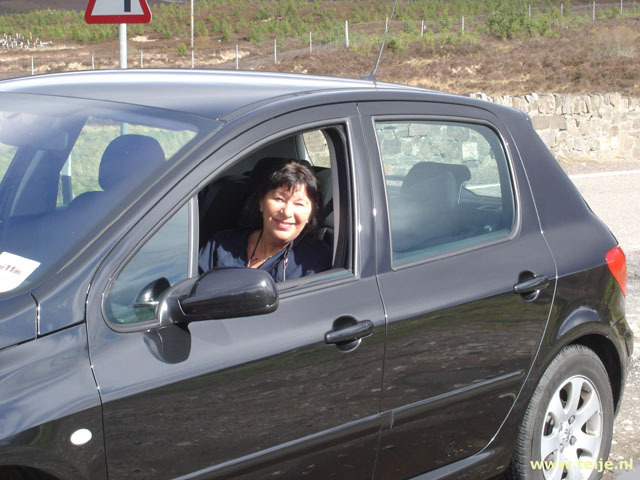 In fact, only 1 lady goes to Ulva with the next ferry. Due to the lack of passengers it is probably too expensive to build a bridge here. Not much further we encounter the Eas Fors Falls, a waterfall that lies right along the road (B8073). The waterfall consists of 3 parts, 1 part which can be seen from the road and the other 2 parts are under the road. We see part 1 and the second that flows into a small lake. The last part we see disappearing further away but to see that part you have to go to the beach, and then we should walk a long way because the rocks are much too steep and too dangerous to descend here. The name Eas Fors Falls is funny because all 3 words mean waterfall: in Gailic, Norwegian and English. Along the coast we continue to the north and see a beautiful sandy beach at Calgary. Scotland has many beautiful sandy beaches, it is just a pity that the climate is not so suitable for sunbathing. 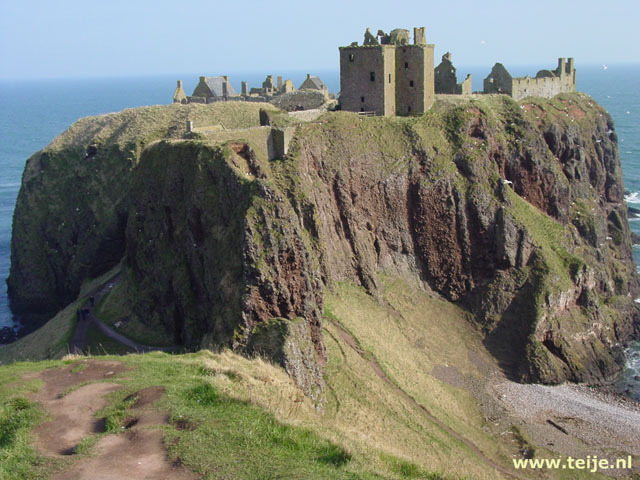 Apart from the weather, Scotland sometimes looks like Greece: many islands, lots of rugged nature, lots of sea and coastline and most people are just as friendly. But well, that weather! And of course they do not have Scottish highlanders in Greece either. The north of Mull consists mainly of rugged moorlands and is flatter than the rest of the island. There are not much roads at all because almost all villages are along the coast and do have their own little harbor, like here at Croig in the north. In the distance we see a monument, but we have no idea what it is for. Mull has a long history, there are remnants of habitation from 8,000 years ago and many traces of battle and war can be found. Enough reasons for a monument. It may be flatter here than the rest of the island but it is still hilly enough. Thousand years ago agriculture was practiced here, shown by the finds in the interior. And like so many peoples in the stone age, stone circles were also built here and large stones were erected, the standing stones. And for some reason we miss out on the Kilmore standing stones near Dervaig, a group of 5 stones of which 2 of 2.5 meters are still upright. Nothing for Teije to miss something like that, he absolutely loves prehistoric sites. But the next piece of history is already presenting itself, the Glengorm castle, also called Sorn. The mansion was built in the 19th century by James Forsyth, who was not very popular with the islanders because he drove people away from their land, even when they had papers to prove it was their property. Now the castle is a hotel with some cottages on the property. A tower room, however, costs at least 300 pounds for 1 night which is an amount I am not willing to pay. We can do much more nice things for that money. And then we arrive at the capital of the island, Tobermory. From a distance we can already see that it is a colorful village because many of the houses are painted in bright colors. Would they do that to make the atmosphere more cheerful when the weather is grey? We have seen this phenomenon also on Skye and on the west coast, just like in Ireland. The village was built for fishing in the 18th century but is now also an important base for tourists visiting the island. In Tobermory is also the only whiskey distillery of the entire island and it makes the Tobermory single malt. But there is also a lesser known peat version, the Ledaig, as the distillery used to be called. We take a walk through the colorful village and take a break in one of the restaurants to eat a cup of hot soup with some bread. If it was not so fresh outside we would of course liked to dive into the bay to find the sunk Spanish galleon full of gold, which according to the legends should lie somewhere in the muddy soil. Then we drive home, a journey of almost 2 hours. After half an hour it starts to rain and we do not leave the car until we are home. In the pouring rain I have to open the gate and then we have to run to the front door but we get soaking wet anyway. Quickly we turn on the stove and then we settle in the conservatory where we look at the passing clouds that darken the sky. When we go to bed, it is still raining.